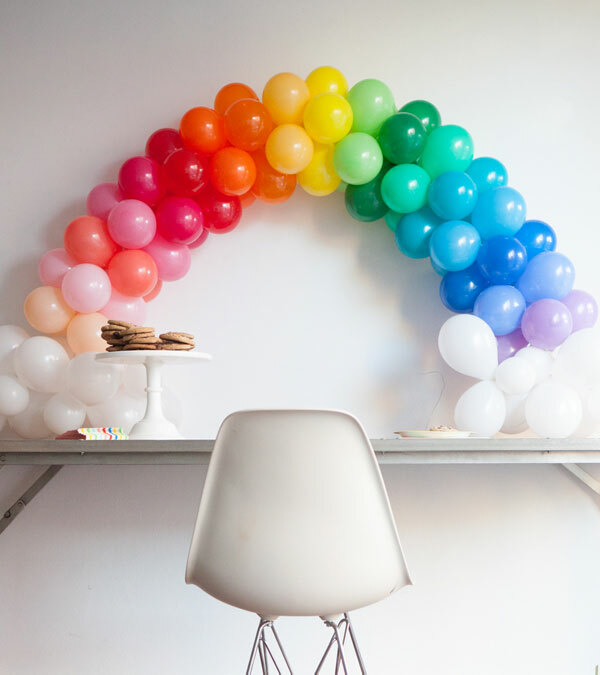 Today we’re sharing a mini version of a balloon arch and would look great as a table centerpiece of photobooth backdrop. Balloon arches are actually really easy to make and mini balloon arches are even easier (less to blow up!) Don’t miss all our other St. Patrick’s Day ideas! Step 2: Tie 2 balloons of the same color together. Repeat with the other 2 balloons of that color. Step 3: Twist both sets of tied balloons together. Step 5: Arrange the balloons around the wire so they’re shaped like a 4 leaf clover. Step 6: Repeat steps 2-5 with all balloon colors. Push all the colors together tightly. Step 7: Blow up white balloons in different sizes. Tie them together in groups of 3 and 4 and twist around the wire on both sides of the rainbow. Step 8: Center on a table on a stabilize with tape. Enjoy! Ah my days this is beautiful!!! And a wonderful idea to add a different center piece and even a talking point about your party table. Thanks from the UK for this lovely idea. 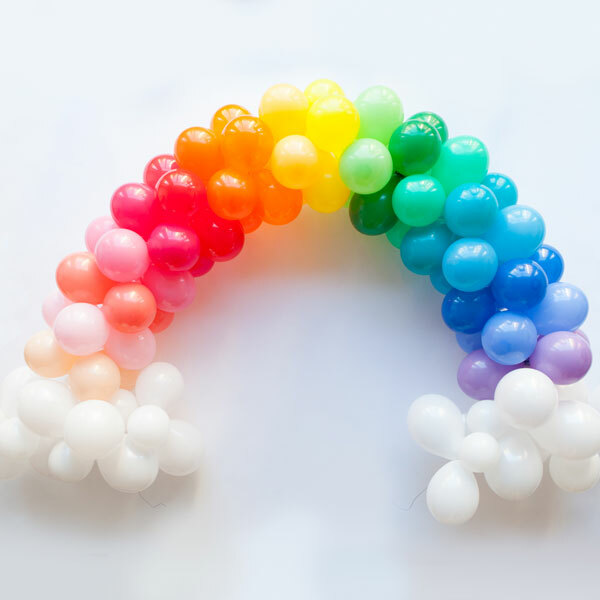 This is fabulous and would make a fantastic centre piece at a rainbow birthday party! 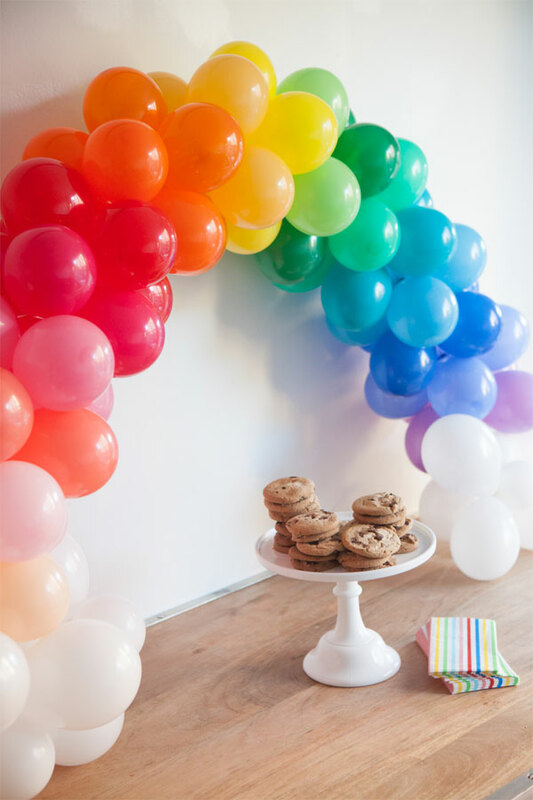 Where did you find the mini balloons in all those colors?? I’ve always wondered how this is done, the clover trick sounds perfect! I’m working on my younger son’s 3rd birthday so I might have to try this out. I love it! I really need one of this to kick off my Monday! I love that it is mini! Makes it so much cuter! So cute! 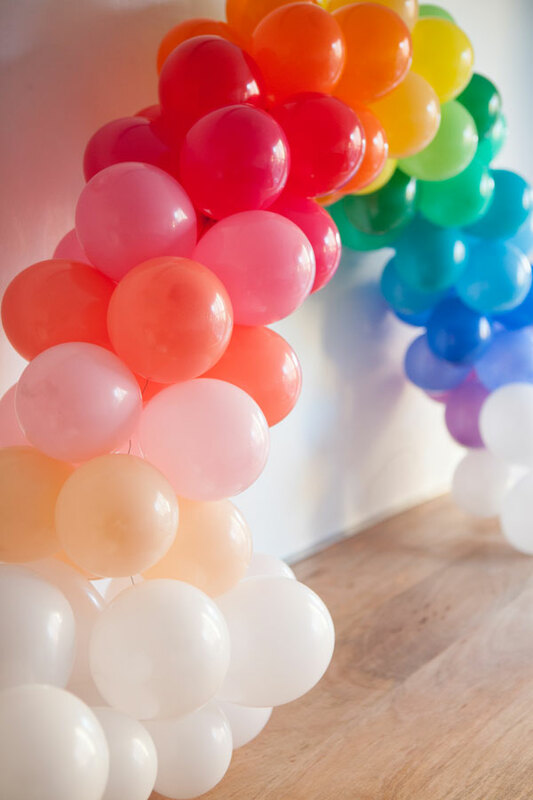 Did you have to buy a whole package of each color of balloons? I guess that wouldn’t be a big deal since you could always use the other ones at another time. This is seriously so fun! I’m definitely going to be doing this for my little girl’s birthday this year! This is perfect for a St. Patrick’s Day party. Just add a pot of gold and a few little leprechauns. Love this! Do you have links to the supplies you used? Looks great .. Could this be created the night before ? How long do these last? 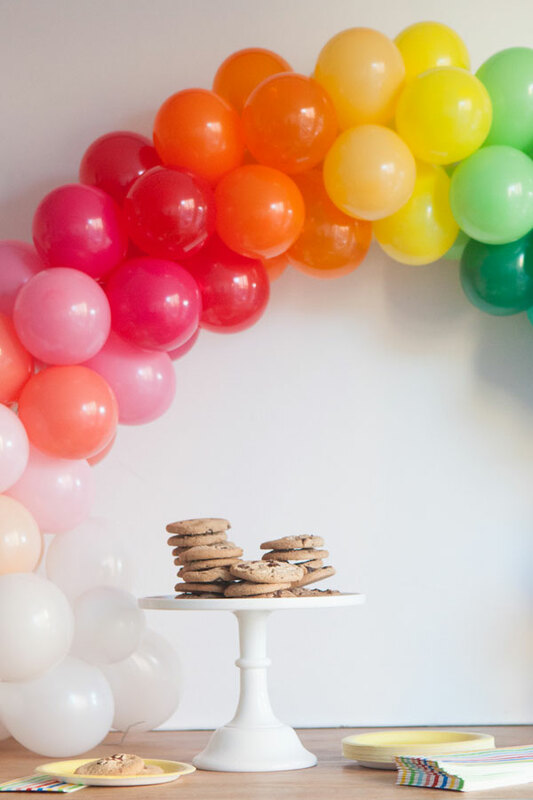 The balloons stay looking fresh for a few days – so you could definitely make it the night before a party. Would so appreciate links to supplies you used!! I live in the middle of nowhere so any info you could share would be so appreciated!! Now how could this not put a smile on your face? So fun and colorful. Wonder if this would be nice addition to my daughter’s 5th birthday that’s in the planning stages??? I think yes! Thans for the fun inspiration! Wow so pretty! I’d love to make them…only if I wasn’t scared of balloon popping on me. This is so adorable! So cute! So glorious!! I love this!! This is so adorable! My son has a St. Patrick’s Day birthday so I can’t wait to make this for him. Any idea what gage of wire your used? Or does it not matter because the balloons sort of sustain themselves? Also, how long did the arch last? I’m trying to figure out how many days in advance I can make this. Thank you!! I would recommend making this 2 days (or less) in advance. The balloons stay inflated for at least a week, but after 2(ish) days, they start to lose air and don’t look as pretty.